The All-Russia Olympiad for international students was held in Yekaterinburg, for the first time in the Urals,. Representatives of 21 higher educational institutions of Russia competed on sports grounds of USUE and at the Palace of Team Sports "Uralochka" on May 3 and 4. Guests of Ural State University of Economics gained a lot of impressions: the students made new friends; the teachers started business acquaintances and even discussed plans for the future. - My students became winners in mini-football and checkers. We competed in two sports and in both won. Last time, the Olympics among foreign students of Russian universities was held in Ivanovo, where our football team also won. On Saturdays and Sundays they do not rest in dormitories, but train, participate in different championships in Ivanovo, and so we move to victory step by step. The event is held perfectly, my boys have good meals and have a good sleep (laughs ).Tomorrow we have a long time before the train and we ordered a tour of the city. Before that, there was simply no time. We will try to buy a book about Yekaterinburg for our rector. We liked the Palace of Team Sports, where mini-football matches took place. The USUE gym is well equipped, there is everything for doing sport. The most important thing is for students to have a desire to study. It is a hard task for educators to cultivate this desire, but we are working exactly for this. - At our University, the Olympiad is held for the first time. I managed to see mini-football: competitions are rather heated. In general, everything is lively, youth is great! From the point of view of mutual relations of students from different countries, it is of course necessary to hold such Olympiads. Sport helps them get acquainted, communicate, establish contacts between educational institutions. - I conducted an excursion for foreign students in Yekaterinburg. They really liked it. Besides, I accompanied participants to the DIVS, to the USUE sports grounds and to the hotel. As a participant of the beauty contest "Miss USUE", I also had the right to participate in the awarding of winners of the Olympiad during the closing ceremony. My volunteer mission made it possible to find out how friendly and sincere our Olympians were to each other despite the fact that they came from different countries and universities, and are competitors in sports. I have a lot of positive emotions and new acquaintances. We are very lucky that the Olympiad is held at our University and that I happened to participate in it. 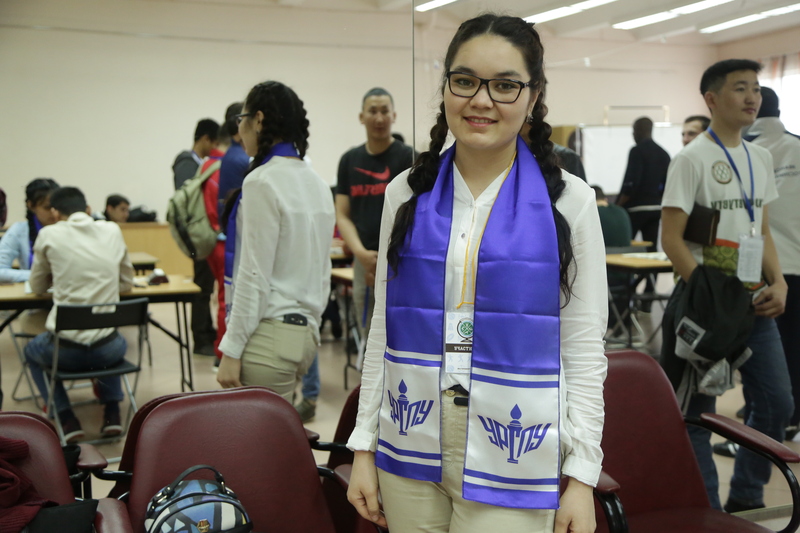 - In our team,there are ten students from Mongolia (five girls and five boys) who take part in streetball, table tennis, and chess. I would like to bring more students, and participate in other sports but meanwhile students can show their abilities only in these sports. This team went to Moscow to compete among Mongolian students, and in this event we participate for the first time and we are quite satisfied with the results. We also have wonderful accommodation conditions: a five-star hotel. We visited the Temple-on-Blood, we looked at Yekaterinburg from a bird's-eye view at the viewing platform of BC "Vysotsky". We really liked the city: both its architecture and the cleanliness of the streets. We also talked with the students from Samara, made friends with teams from Siberia and from Tyumen. We have learned how the educational process was organized at their universities. Siberians conduct interesting cultural festivals and we were invited to participate. - We are the first time at the Olympiad. Yesterday our youngsters played streetball, they lost, but they did well, they tried their best. We were announced about the Olympiad a month ago, and all this time we were training in volleyball, tennis, and shooting. Here we have found new friends, met Africans from UrFU and USUE, now we will communicate through VKontakte. - Everything is fine at the Olympiad! In our team, there are guys from Ghana, this is in West Africa, and a participant from Vietnam and a participant from Turkmenistan. We are for the first time at the All-Russia Olympiad of International Students. I am in the mini-football team. We could not win as our opponents from Volgograd and Moscow were stronger. But we found many new friends from different countries of Africa who study at other Russian universities and we will for sure communicate in social networks. "I've been playing checkers since I was a kid." I like to spend time with playing checkers, where you need to think a lot and be attentive. I thought that I was playing well, but I was not happy with the results at the Olympiad. This is more than outweighed by the atmosphere of the competition. I really liked the University: it is light, beautiful, clean all around; it was interesting to go through the buildings and have a look at the classrooms. At the competitions I met with guys from Africa, Mongolia, Uzbekistan, and we exchanged contacts. The All-Russia Olympiad for international students was held in Yekaterinburg, for the first time in the Urals,. Representatives of 21 higher educational institutions of Russia competed on sports grounds of USUE and at the Palace of Team Sports "Uralochka" on May 3 and 4.